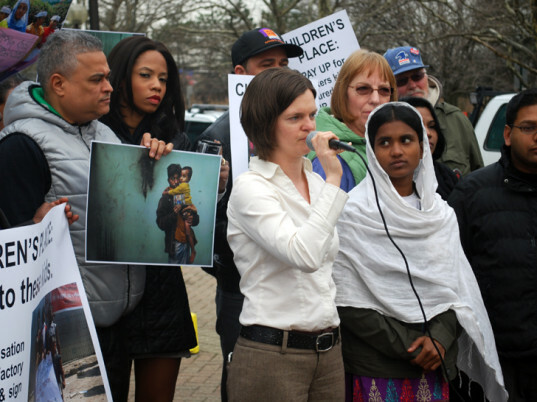 Khanam (left), protesting outside The Children’s Place in April. Aklima Khanam may have survived the deadly collapse of the Rana Plaza building in Bangladesh on April 24, 2013, but you’d hardly call her one of the lucky ones. Once the breadwinner of her family, the 20-year-old sewed loops onto pants seven days a week, 120 hours a week, for $125 a month, until that fateful day left her with multiple head, chest, and leg injuries—not to mention untreated post-traumatic anxiety—that prevent her from finding work. Liana Foxvog of the International Labor Rights Forum spoke to Khanam on April 6, while she was on a speaking tour of the United States organized by United Students Against Sweatshops. This is her story. Foxvog, holding the microphone, with Khanam outside The Children’s Place. I was 14 years old when I started working at a garment factory. There was a family dispute about property. My uncles took our family’s plot of land—our only source of income. My dad was ill and couldn’t work. I gave up studying to help my brothers and mom. In order to support my family, I had to work. I’m the second oldest; I have four siblings. Did anyone else in your family work? My older brother started working two years after I started. My mom didn’t work then. She works now since I’m not working. When did you start working at Rana Plaza? I started on January 3, 2013. 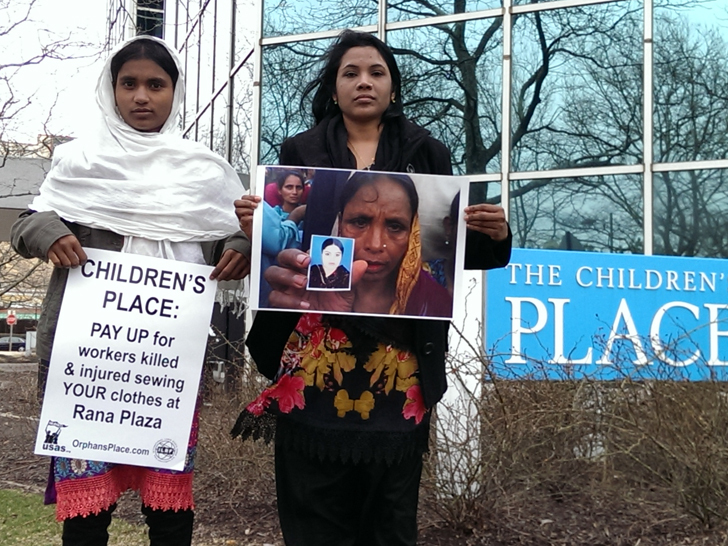 Where at Rana Plaza did you work? I worked on the 8th floor. At New Wave Style. What was your experience on April 24, 2013, the day of the building collapse? Management forced us to go into the factory using physical violence and said that there was a shipment of 24,000 pieces that needed to go out. They said we would be fired and not paid if we couldn’t meet the target. Soon after we started working the power went out. Then the generator went on. Moments later the building collapsed. A machine fell on top of me. I was trapped under it. A man next to me died immediately. I was trapped for 12 hours until a rescuer found me. I had a head injury, my chest hurt, my hip hurt, my ankle hurt.? Describe a regular day since the collapse. I stay at home. I do housework. I’m ill a lot of the time so I can’t do much. There are points when I’ve had to stay in bed for 15 days at a stretch. ?Describe the symptoms that you experience. I had a head injury. I used to have bleeding in my mouth. I used to get terrible headaches. I can’t lift heavy objects because of the machine that fell on my chest.? What kind of machine was it? The kind we use to put belt loops onto waistbands. A belt-loop sewing machine. It weighed 100 kilos. What symptoms keep you from working? I have pain in my hip if I sit to work at a sewing machine. And I have a lot of fear because of the building collapse.? Have you received any counseling or therapy? I haven’t. There’s a folk medicine of putting water on my body to make the fear go away. I’ve done that.? Were you hospitalized after Rana Plaza? For how long? I was taken to the hospital. My parents brought me home the same night at 11 p.m.. I’ve paid 30,000 taka ($387) in doctor’s bills. I don’t have the money to get all the medical treatment that I want. ?What sort of medical treatment would you like to get? I want medical treatment so that I can be the way I was before so that I can work again. ?How is your family getting by now? My mom is the main earner in the household. Only my sister is in school. Two of my brothers can’t go to school and my oldest brother is done with school. ?What type of food can your family afford? Rice, lentils, vegetables. Once every 15 days, we have meat or fish. ? Have you received any compensation since the collapse? I got 45,000 taka ($580) from Primark and 7,000 taka ($90) from Bangladesh Garment Manufacturers and Exporters Association. Because the owner fled, BGMEA stepped in and gave us the wages we were owed for April—that’s what the 7,000 taka ($90) was for.? Did you know what buyers you sewed for? ?How did you know you were sewing for these buyers? Management would say: “This work is for Walmart, we have to do a really beautiful job.” Or they would say Children’s Place, Loblaw, Corona, or Max. ? How were you treated at the factory? Management gave me a target of 100 to 150 pieces per hour. They used to pressure me to work harder to increase my pace. They said bad words at us. They said “your parents are children of pigs.” They called me “sister f*cker” and “whore” and many other kinds of abusive language. ?Did they do anything else to you? They would kick us off the stool, pull our hair, they would hit us. ?When would they do these things? They would give me a ton of work and if there was one or two mistakes, they would do this. They would time my bathroom visits and tell me how much time I spent in the bathroom and if I spent too long, they would do these things. If I didn’t meet the production target they forced me to work unpaid overtime. ?What was the regular workday? Most days I had to work 8 a.m. to midnight. 8 a.m. to 5 p.m. is supposed to be standard workday. Sometimes I had to stay until 2 a.m. or 3 a.m. and sometimes I had to stay overnight. There were days where I started at 8 a.m. and stayed until 8 a.m. the next day.? If you didn’t want to work the overtime, could you just go home? I could never choose when to leave. Management told me when it was time to leave.? What days did you have off? I didn’t have any days off. Friday is the standard day off but we didn’t get that day off. We worked seven days a week. ?You never had any days off during January 3 to April 24? I was absent three days that whole time. In the process of working I would get ill, but they wouldn’t give me a day off, so I would just be absent. ?How much money did you bring home? I normally took home 10,000 taka ($129) a month; 5,500 ($70) was my base wage and the rest was considered overtime. ?Did you ever see buyers visit? Yes. The buyers were not concerned with what the conditions were or how the work was being done. They were only concerned with the final product. ?Did they talk to workers? Management forbade us from talking to buyers. The buyers only want high quality work produced on time. ?Do you want to work again? Where would you want to work? What do you envision your future looking like? I don’t really know what I want to do. If the brands don’t pay compensation, it will be really difficult to get by. If they pay compensation we’ll somehow get by. If everyone put pressure on the brands, then Walmart, Children’s Place and all others might pay compensation. With assistance from the ILRF, Khanam authored a petition on Credo Mobilize, one that has been signed by more than 55,000 people in just three days. This Interview Will Change the Way You Think of "Fast Fashion"
Khanam (left), protesting outside The Children's Place in April.